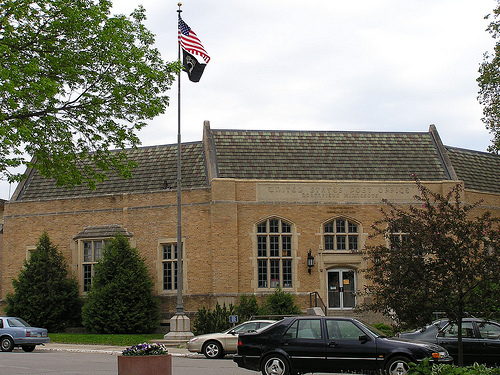 As most of you are aware, there has been much discussion about the proposed closing of the historic post office in downtown Northfield by the United States Postal Service (USPS). The NDDC is determined to oppose this closing. The issue was discussed at the March 16th NDDC Design and Planning Committee meeting. City Administrator Tim Madigan is a regular participant and the “Downtown Councilors”, Betsey Buckheit and Suzie Nakasian, were also present. The initial outlines of a strategy were developed. Subsequently, Mayor Mary Rossing and Administrator Madigan asked the NDDC to convene a group representing interested stakeholders to review the situation and develop a strategy related to the proposed closing of the Bridge Square Post Office. NDDC Design and Planning Committee Chair Keith Covey convened the first meeting on Friday morning. The initial group includes the Chamber of Commerce, the colleges, elected officials, and City staff. Councilor Nakasian recently traveled to Washington, D. C. and met with a number of key people on this subject. She determined that no decision has yet been made to close the downtown Northfield post office and was advised on the process to be followed by the postal service. She urged community members to strongly but courteously resist the closure of the downtown post office. NDDC Executive Director Ross Currier was able to obtain contact information for individuals playing key roles regarding the downtown post office. NDDC Retention and Recruitment Committee Chair Brett Reese contacted these individuals. He confirmed that no decision had been made regarding the downtown post office. Based on the unsolicited statements of dozens of downtown business people, it is clear to the NDDC and the Task Force that the closure of the downtown post office would have a significant negative economic impact on downtown Northfield. The Task Force determined to do whatever possible and necessary to resist this closure. 1) There has been no decision on the Downtown Post Office. 2) The closure of the Downtown Post Office will damage the downtown economy. 3) Closing the Downtown Post Office and relocating its functions is a bad business decision for the USPS. NDDC Board members, working with members of the Task Force, are preparing letters to Federal elected officials and regional and national USPS staff. An on-going process of developing key talking points has also been initiated. These points, and key contacts, will be made available to the general public as soon as they are available.